The goal is simple: have your business appear more visibly in Google Places when local customers search for what you offer. But there are all kinds of ins and outs and moving parts, big and small. They can be tough to remember. You and I and everyone else forget all kinds of things; some of us are especially good at forgetting about household chores and anniversaries. But one thing we don’t forget is our ABC’s. 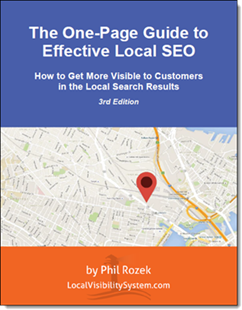 That’s why I bring you the ABC’s of local visibility in Google Places: 26 little blurbs devoted to the stuff you need to know to get your business visible to local customers. How well do YOU know your ABCs? Do you know enough letters to spell your own business name? Your business phone number needs to have a local area code–not an 800, 888, etc. Always use this local phone number for your business: use it on your Google Places listing, on your website, and on every other website you ever list your business on (Yelp, CitySearch, etc.). It’s important that Google and potential customers know you’re a local business—not some faceless chain trying to scoop up local business where it shouldn’t. Plus, it’s important that local people know you’re local, too. 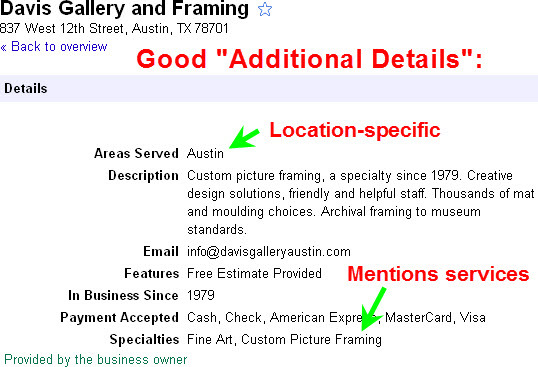 On your Google Places listing, you can specify up to 5 “Categories” that describe your business. These influence which search terms you’ll be visible for locally. Try to pick as many relevant categories as you can—categories that accurately describe your business or services. Google may not have your specific category of business, in which case you have to choose at least ONE category from Google’s list. In this case, pick the one that’s *most* relevant (it may not be spot-on), and then I suggest you specify a couple of “custom” categories, using terms that really accurately describe your business/services. Simply type them into the fields. You’re probably familiar with sites like Yelp.com, InsiderPages.com, etc. 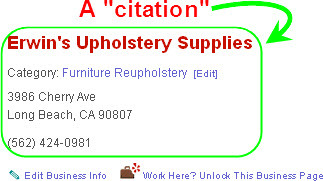 Any time your business is listed in the local-business directories of sites like these, that’s called a “citation.” Citations are a giant factor in how well you rank locally. They’re similar to links in the world of traditional “organic” search. Long story short, you should try to get your business listed on as many as you can–the aforementioned ones, plus others like CitySearch.com, JudysBook.com, AngiesList.com, and many more. Oh, and make sure that all the business information you submit to these sites EXACTLY matches what you use on your Google Places listing: so, for instance, use the exact same business name, with the same punctuation and capitalization, the same address formatting, etc. A fancy name for sites that collect your business info and distribute it to many other sites that list local businesses in their directories. ExpressUpdateUSA, EZLocal, LocalEze are examples of data-aggregators. Basically, you’ll want to go to these sites and list your business on them, and make absolutely sure that all the info you provide matches the info you use on your Google Places listing. In the “Edit” area of your Google Places page you’ll notice some boxes where you can provide “Additional Details” about your business. You should fill it out with as much relevant detail as possible. But don’t just throw in a bunch of keywords: try to provide highly specific detail about your services: if you’re a doctor, indicate your specialties or say what kinds of injuries you treat. If you’re a roofer, specify whether you service residential vs. commercial buildings, or both, or whatever. Use Google Places to get visible in your immediate local area, first and foremost. Don’t use it to try to get visible in a city that your business isn’t physically located in. All too often, I see businesses in the suburbs trying fruitlessly to get visible in Google Places in the major city that they’re several miles outside of. They load up their Google Places listing and websites with the name of the major city in which they want to get visible, hoping that Google will pay attention to their repetitive use of location keywords. It rarely works, unless they’re in relatively uncompetitive markets or they’re one of only a handful of local people who provide a certain service. Location is a really complex issue in local Google, but here’s the key point: if you want to be highly visible to local customers in (say) central Chicago, you’d better be located in the middle of Chicago. If you’re in the suburbs, your best bet is to focus your efforts on getting visible in and around your specific ‘burb, and then to use AdWords (not Google Place) to get visible to customers in any areas that are more than 1-2 miles away from you. Often unclear and inconsistent in making the policies you and I have to live by, and occasionally downright maddening to deal with. But Google is where the customers—including you and me—most often search locally. Some people talk about how social-media is what matters for businesses. That may prove true one day. But as it stands today, companies like Facebook are going through a noisy adolescence on their way to maturity: on the web in 2011, Google is still Big Daddy. To make sense of “H,” you’ll need to take a look at letter “N” (lower down). Short for “Internet Yellow Pages.” Just a fancy name for sites like Yelp.com, HotFrog.com, and many other sites with big directories of local businesses. Local-search experts love this term (it’s pretty good, I have to admit). Often used interchangeably with “search term,” but there’s a distinction: “Pizza” is a keyWORD, whereas “pizza place” is a “search term,” because it’s multiple words. We all know that good, relevant links matter to the “organic” ranking of your website. But, to a lesser extent, they also matter for your ranking in Google Places. I’m not going to go into detail about how you should get links, other than to say that you should NOT just try to “buy” them or do an exchange with some worthless website that has nothing to do with your specific services or business. Oh, and don’t try to get links to your Google Places page: they won’t help you. Any links you get need to lead to your website. You’ll probably notice a slightly different assortment of local businesses under the “Maps” tab. I mention it because it’s worth knowing that Google ranks businesses slightly differently under the “Maps” tab, and because you should always make sure you know where YOUR business ranks there. Stands for “name, address, phone.” You need to have the official name, address, and phone number of your business at the very bottom of every page of your website. This helps show Google that all the info you use in your Google Places listing is accurate. In fact, the NAP at the bottom of your webpages must exactly match the name, address, and phone number you use in your Google Places listing. The formatting should be standard (as though you were addressing a letter to your business), meaning no crazy capitalization or punctuation. Do NOT use an image; the NAP has to be written in text—text that you can copy and paste. Otherwise, Google’s “spiders” won’t be able to read it, and your ranking may suffer. AKA the “normal,” non-local search results we’ve seen in Google (and Yahoo, and long ago in Lycos, AltaVista, etc…) since before the local search results ever existed. The organic search results show only websites, not websites plus Google Places pages. What many people don’t know is there’s actually a surprising amount of overlap between the organic search results and the local search results. What I mean is that your website matters to your local ranking: you benefit from standard SEO best practices, lots of original and informative content, and high-quality incoming links to your site (see letters K, L, N, S, T, U, W, and X). In other words, the practices you’d follow to get a good organic ranking generally also help you improve your ranking in Google Places. Let’s say you and I run two competing businesses in the same city…let’s say two cigar shops in Cincinnati. If yours is downtown and mine is a couple miles outside downtown (but still in Cincinnati proper, not the suburbs), your cigar shop will have a slight advantage in Google Places, and may rank a little more highly. By no means is this always how it works out, but proximity to downtown (aka the “city centroid”) is a factor. It’s more of a factor if there’s a great density in your local area of businesses like yours, but if there aren’t many others who offer what you offer, geography is less of a factor. If you’re not located downtown, don’t try to fake your address just to pick up a slight ranking advantage. It doesn’t really work and it can confuse customers. First try to get visible in your immediate local area, wherever that may be: use AdWords if you want to get extra visibility outside of that. Stands for “quick-response code.” QR-code stickers are pretty cool: they’re barcodes that you scan with a smartphone. Once you do, you’re taken to a specific website (the bars in the QR code are actually a link). It’s possible to receive a decal from Google that contains a QR code for your Google Places page. You put this decal outside your store/office/location, and customers can scan it with their smartphones and automatically go to your Places page to write you reviews, read reviews about you, and look up information about your business. Sooooo much to say about this one. Better restrain myself. First of all, reviews are a crucial part of your visibility in Google Places. You need real reviews from your real customers. Not a ton of them, and they don’t all need to be positive, but you do need a small trickle of them (maybe 1-2 a week). You’ll want a method for getting customers to write them directly on your Google Place page and through third-party (“IYP”) sites like Yelp and CitySearch. The other thing to know is that Google’s handling of reviews is riddled with bugs. It used to be worse, but sometimes reviews for another business will show up on your listing for no reason. Or sometimes your hard-earned reviews will mysteriously vanish, as though beamed up by Scotty. The problems usually sort themselves out, but don’t be too alarmed if/when you encounter them. Casual visitors to your Google Places page need to stick around long enough to want to visit your website. Then they need to stick around on your website long enough to discover more about what you offer, be impressed by it, and maybe pick up the phone. You do this by providing as much specific information about your services as you can (exactly what you do, how you do it, etc.) and, whenever possible, how it benefits the customer. Do this in the “Description,” “Coupon,” and “Additional Details” areas of your Places page, and especially on your website, where you have much more room to show potential customers exactly how you can help them. Do it effectively and people won’t just bounce off of your listing and website: they’ll stick and become customers. You’re more likely to rank well in your local market if your website name (your URL) is phrased relevantly to your services and/or location. For instance, if you’re a plumber in San Diego, you’re somewhat more likely to rank well for searches for “San Diego plumber” if your website is “TopSanDiegoPlumber.com” rather than “PipeProsSanD.com. If you’re interested in getting a new website name but aren’t totally sure how to pick out a good one, this flowchart might help. One of the first steps to adding your business to Google Places. When you “verify,” you’re telling Google that you’re the rightful owner of the business you’re creating a local listing for. Until you do it, your business most likely will be invisible locally. Verifying also allows you to control exclusively what’s on your Places page; before it’s verified by the business owner, anyone can edit it. It’s also possible for some slimy marketers or competitors to “hijack” your Google Places listing—but they can’t do it once you’ve verified. Here’s more detail from Google. If you haven’t verified your listing yet, you can follow the steps in this flowchart. You didn’t think I’d try to tell you what a website is, did you? Nope, I just wanted to say that your having a website is crucial to getting visible in Google Places. Your website contains a number of specific factors that affect your ranking (including your title tag, description tag, overall domain authority, and the relevance of your content/body copy to the services you’re trying to get found for). Plus, customers want and expect to see a website so that they can learn more about your services. f you don’t have one, you’re losing big. Your website should have what’s known as a “Google Sitemap,” which is written in XML format. This is simply a file you upload through “Google Webmaster Tools” that gives Google an inventory of all the pages of your website, so that it knows they exist. This can help your website rank more highly, and therefore can help your local visibility to customers. Your webmaster should know how to put up together one of these sitemaps, but here’s more detail from Google if you’re a DIY type. A great site that’s crucial to your local visibility. Millions of users/active reviewers. If your customers can write you some reviews on Yelp.com, that’s good. Just don’t specifically ask them to log onto Yelp and write you a review (that’s against Yelp policy); simply mention it as one way they can leave you a review. The most important thing for you to do, however, is just to make sure that your business is listed on Yelp, that you’ve claimed your listing there, and that all your information is 100% accurate and current. Make absolutely certain you enter your ZIP code correctly every occasion you have to enter it—that is, on your Google listing and every time you list your business on other sites. If you enter so much as one digit wrong, you could really screw things up, because Google will be receiving conflicting information as to what city you’re located in. Don’t bother with the extra 4 digits: the regular 5-digit ZIP code is fine. Now was that tougher than the ABC’s you learned back in preschool? Thanks again Phil for all your guidance on local rankings. Google has certainly changes the game from just a few months ago! Every thing that worked for along time is now long forgotten. Time to redo many of my customers websites because the local landscape has changed so dramatically!